Like any news organization, Macworld spends a lot of time thinking about community—how to foster a vibrant online community through comments and forums, how to define our role in that community, and how to reach out to the broader Mac community through events and meetings. One thing that makes that task easier is the strong sense of camaraderie and support that already exists among Mac users. More than once, I’ve had complete strangers strike up conversations with me at the airport or a café simply because they spotted my laptop or an issue of Macworld in my lap. So it doesn’t surprise me at all to find that same sense of Mac community alive and well on the online photo-sharing site Flickr. If you’ve somehow missed Flickr, here’s the scoop: Flickr lets you upload your photos, assign keywords describing their contents, and then publish them for other Flickr members to see and comment on. (Of course, you can choose to keep them private. But where’s the fun in that?) Flickr members can then create groups that pool together images with a common theme from the entire Flickr population. It’s community building at its best. • Apple PhotoBooth and Mac PhotoBooth: See the sometimes frightening—but always hilarious—portraits people create with Apple’s PhotoBooth software. 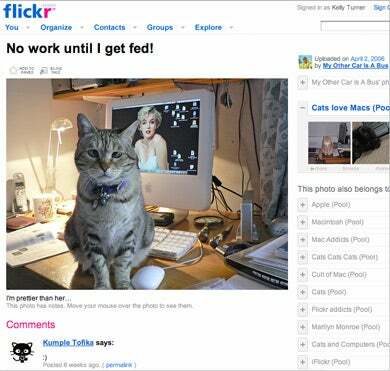 • Cats Love Macs: The title of the group pretty much says it all. • The Album Art Game: Want to show off your music collection? Take a photo of Tiger’s iTunes screensaver, showing the album art from your music library. Others Flickr members then try to identify as many of the albums as they can by adding notes to the different album covers. • Macintosh: Share your obsession with like-minded Mac users. There are almost 18,000 photos and nearly 8,000 members in this photo pool, which is dedicated to all things Mac related. And while I know if won’t come as much surprise, I have to point out that you don’t see anything approaching that kind of enthusiasm from Windows users on Flickr. In fact, a search of Windows groups mainly turned up screenshots of error messages. Sometimes a photo is indeed worth a thousand words.